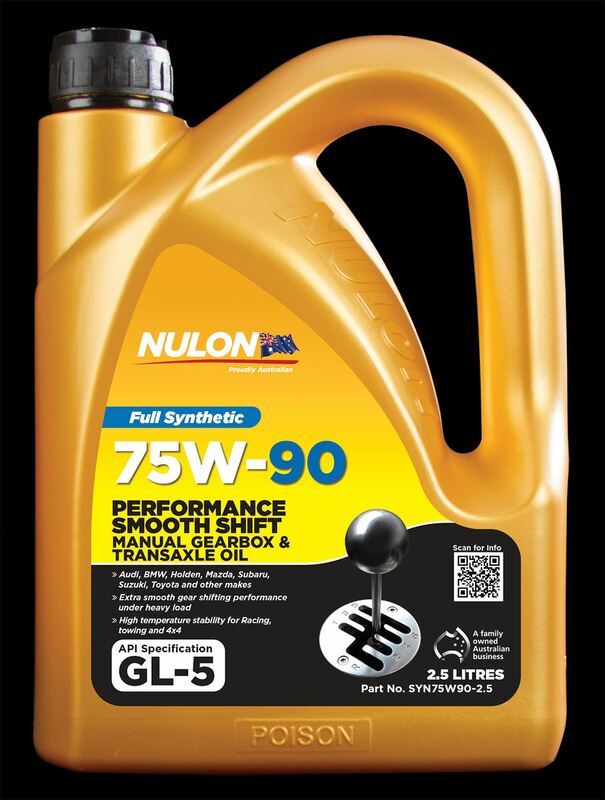 Nulon SYN75W90 is a fully synthetic API GL-5 and API MT-1 hypoid gear oil, providing superior wear protection, excellent low temperature characteristics and high temperature stability when compared to conventional mineral gear oils. It is the preferred substitute for SAE 80W-90 or SAE 90 oil promoting smoother, faster gear changes. Ideal for use in transaxles with combined manual gearbox and hypoid differential. It is recommended for use in passenger cars, towing, 4x4, light commercial and racing conditions. Nulon SYN75W90 is formulated from hydrofinished base oils with superior additive packages to enhance wear protection, corrosion protection, and low temperature characteristics. The optimized formulation has optimum oxidation and thermal stability to ensure fluid durability and performance during its life time. The hydrofinished base oils used in SYN75W90 is a Very High Viscosity Index (VHVI) base fluids that have advantages of low volatility for better oil consumption, low wax content for improved low temperature fluidity, high saturate level for excellent thermal and oxidation stability, and low sulfur and aromatic compounds for better environment friendliness. Nulon SYN75W90 is ideal for use in transaxles with combined manual gearbox and hypoid differential. Recommended for use in passenger cars such as Ferrari, Ford, Holden, Lexus, Lotus, Porsche, Subaru and other makes where API GL-5 performance is required. Recommended for use in light commercial and 4x4 vehicles such as Chrysler, Ford, Holden, Kia, Landrover, Mazda, Mitsubishi, Nisan, Ssangyong, Suzuki, Toyota and many other makes where API GL-5 performance is required.